As a new music producer you will have quite a learning curve to understand all the new compositional tools and audio processing that is available to you including, audio recording, sequencing MIDI and soft synths, mix balancing, equalization, dynamic control etc. so mastering may not be at the forefront of your mind. This is understandable as initially your music productions may not warrant professional mastering until you have honed your production and mixing skills further and are creating good quality well balanced mixes. However I believe it is worth knowing some of the fundamental principles of audio mastering so when the time comes you are well prepared from the outset. What is the process of audio mastering ? Mastering is the final music production process, within the confines of a very accurate studio environment (acoustically and in terms of reference grade, full spectrum high resolution monitoring) it’s goals are sonic corrections though use of equalizers and dynamic control, enhancements, volume balancing, decision making relative to perceived volume, sequencing and spacing of tracks, final quality control (click removal etc) and creation of distribution file formats and media. (such as DDP and CD-R or compressed files) During mastering the engineer can also enter important identification codes such as EAN/UPC bar codes and ISRC codes. During mastering it is normal to work with the format of a stereo 2 track mix. Normally a mastering engineer will not want all of your multi-track files and your mix session file. 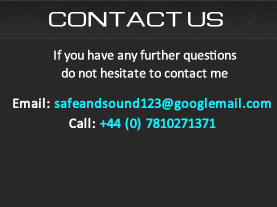 As an additional service some mastering studios include mix appraisal/advice within their pricing. This can be a valuable inclusive service to new music producers. Important : Mastering uses the stereo 2 track stereo interleaved file format. 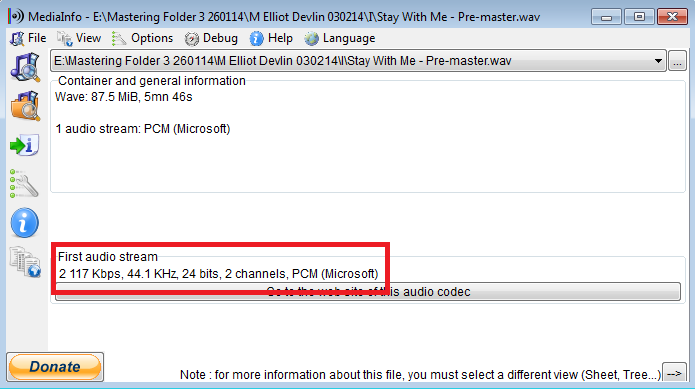 The most common mix file format required for mastering would be the stereo interleaved 24 bit .wav or .aiff file. These files are created once you have mixed down your music. All digital audio workstations (DAW) will allow a mix down to be exported or bounced out. The most common mix down file would be at 24 bit resolution, a stereo interleaved file means that a single uncompressed file is created with both left and right channel information embedded. You can choose .wav or .aiff files. (Historically .wav file is the PC version and aiff stands for audio interchange file format as created by Apple) They are to all intents and purposes identical. To some degree .wav file has become the industry standard. You may see options for 16bit and 32 bit floating point in your options list. 16 bit audio should currently be avoided as it is compromised. 16 bit audio has only a theoretical dynamic range of 96dB and 24 bit 144dB. 24 bit is superior and allows you to record audio signals with some additional headroom without any digital audio compromises. 32 bit files are unnecessary large and provide dynamic range which is excessive for the needs of music making. 32 bit files are however used internally within a DAW for complex mathematical processes. 32 bit files increase accuracy of this maths and reduce accumulative errors. Your DAW will already be taking care of this internally. With regards to sample rates, export the mix down file at the same sample rate of your DAW project or session. Mastering engineers have excellent tools for sample rate conversion and this is best left for them to process if necessary. So if you started at 48 kHz bounce out at that very same rate. In fact when recording at 24 bit a peak signal level of -10dBFS is perfectly ok and this avoids the chances of clipping your sound card inputs which is best completely avoided as distortion is one of the most troublesome audio artifacts to correct. Compressed file formats are not appropriate for rendering a mix or mastering. You should never create compressed audio files for mastering. They are convenient because of the reduced file size but the audio fidelity is compromised from the outset.Compressed audio formats are those such as MP3, AAC, Ogg Vorbis, WMA, m4a etc. These files formats are created by using a computer algorithm to reduce the data rate. It means that valuable sonic information is stripped away to create the smaller file format. They are not suitable formats for rendering mix downs or for mastering and should be avoided. They are only to be used if you must create a lower resolution compressed file for distribution on social media sites or as an optional download format. Can I convert MP3 to a wav file and increase quality ? Avoid clipping and limiting your DAW stereo bus when exporting your mix down file. When you bounce or export your stereo interleaved file format for mastering your should bounce it without a limiter on the master output. Limiters arrest peak information in a mix. Mastering is most effective when a piece of music is not limited. When a piece of music is not limited the mastering engineer has a better chance of manipulating the audio using their experience, skills and tools to provide the best sounding result. Additionally you must check that your file does not clip the stereo output when you remove any limiters from the stereo master bus. Clipping is when the meter on the output of your DAW hits the end. As soon as the signal hits the end it distorts. There is not gradual or progressive distortion. As soon as 0dBFS is exceeded it is clipped. So ensure your mix is peaking at no louder than -6dBFS when you bounce it. If it is you can pull down the master output fader until it peaks at -6dBFS on the loudest part of the mix and then export the file at 24 bit resolution. What mastering can and cannot do. Mastering relies on a good mix down in order to bring out the best in a track. During mastering there will very little flexibility to adjust individual instruments because the stereo 2 track mix format which mastering uses fixes individual elements in the mix balance. Note: Adjusting the level of instruments is the job and process of mixing not mastering. Mastering is an important process that adds value and ensures your music will sound as good as possible. It relies on a good mix. If you found this of interest please feel free to share on forums and via social media and check out our mastering FAQ page for in depth details on mastering file formats and preperation.